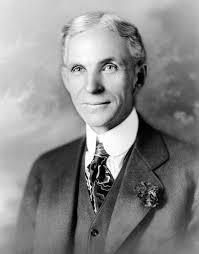 Today in Masonic History Henry Ford is born in 1863. Henry Ford was an American industrialist. Ford was born on July 30th, 1863 on the family farm in Greenfield Township, Michigan. At the age of 13, Ford was devastated when his mother passed away. At the age of 15, Fords father gave him a pocket watch. Ford would take the watch apart as well as those of neighbors and family and would gain a reputation as a watch repairman. In 1879, Ford moved away from home. His father had hoped he would take over the family farm. Ford once said of the farm "I never had any particular love for the farm—it was the mother on the farm I loved." Ford would head to Detroit and would work as apprentice as a machinist. In 1882, Ford would return to Dearborn and the family farm. There he would operate and maintain the Westinghouse steam engine. He would eventually turn that knowledge into a job with Westinghouse. While he was still on the farm, Ford studied bookkeeping at Goldsmith, Bryant & Stratton Business College. In 1891, Ford began work for the Edison Illuminating Company. Eventually he would be promoted to Chief Engineer. With the promotion and higher pay, Ford was able to experiment with gas engines. In 1896, Ford would create what he called the Ford Quadricycle and would test drive it on June 4th of that same year. Shortly after the test Ford attended a meeting of Edison executives, there he met Thomas Edison who approved of Ford's experiments. Edison encouraged Ford to create a second vehicle which he completed in 1898. In 1899, Ford created the Detroit Automobile Company with a local lumber baron. The automobiles produced were below Fords standards and the prices were too high in Ford's opinion. The company dissolved in 1901. At the end of 1901, Ford had begun making racing cars. With some local stock holders Ford helped form the Henry Ford Company with Ford as the Chief Engineer. Ford left the company the following year after a dispute with the principal stock holder. With Ford gone, the company name was changed to the Cadillac Automobile Company. At the end of 1902, Ford would build another racing car and that would lead to another company, Ford & Malcolmson LTD. The company contracted with the machine shop of John and Horace Dodge for parts. Ford's first order was for $160,000 in parts. Unfortunately sales were slow and Ford and Malcolmson did not have the money to pay the Dodge brothers. A new group of investors was brought in and the Dodge brothers were convinced to accept a stake in the newly formed Ford Motor Company in 1903. The Ford motor company was noted for it's innovations. In 1908, Ford released the Model T. It was notable for it's affordable price of $825, it had it's steering wheel on the left which other car makers soon copied, a solid block engine and enclosed transmission. By the 1920's the majority of American drivers learned on a Model T. In 1913, Ford introduced the moving assembly belts into his factory, although Ford is credited with the idea, contemporary sources state that it was 4 employees of the company that came up with the idea. It is from the assembly line that we get one of the more notable Henry Ford quotes "Any customer can have a car painted any color that he wants so long as it is black." In fact the Model T was available in multiple colors prior to the addition of the assembly line. The quick drying nature of the black paint was what compelled Ford to use only black to maintain efficiency. It wasn't just in technology that Ford was cutting edge. In 1914, Ford was a pioneer in "welfare capitalism" when he introduced the $5 workday (the equivalent to a $120 work day today). Ford had the simple philosophy that if you kept your quality employees happy there would be less turn over and the company would be more efficient. The plan worked and began changing the landscape with other car makers, forcing them to pay higher wages to hold on to their key employees. He was also one of the few employers in the car industry that was hiring, blacks, women and men with physical handicaps. In 1918, Ford turned over the presidency to his son Edsel. He then made a big show of leaving the company and starting a new company, taking his top employees with him. It turned out to be a ploy to convince the remaining stockholders to sell their shares in fear that they would lose money when the new company got into full swing. The plan worked, Edsel and Henry Ford bought up all the remaining stock and made the Ford Motor company a family business. In the early 1920's Ford sponsored a newspaper called The Dearborn Independent. The paper was bought by one of Ford's closes aides and private secretary, Ernest G. Liebold, on Ford's behalf. The paper had many articles written by Ford all highly anti-semitic. Ford is the only American mentioned in Mein Kampf where Hitler praised Ford. In the late 20's a representative of the Nazi party came to visit Ford, allegedly he asked Ford to contribute to the Nazi party and Ford refused. Later many of Ford's friends came out to say that they did not believe Ford wrote any of the articles that were attributed to him. They stated that they had warned Ford not to let his name be used in that way and doubted that he ever read the articles before they were published. The paper only lasted 7 years. Ford passed away of a cerebral hemorrhage on April 7th, 1947. Ford was raised in Palestine Lodge No. 357 in Detroit, Michigan. In 1940, when Ford received his 33rd degree he stated "Masonry is the best balance wheel the United States has."